First of all, it’s my blog’s birthday. what?bread? is one year old today. Thank you to everyone who’s ever taken a peak and I hope you’ve found what you’ve come looking for. If not, please leave a message or ask a question. This month is going well and I hope to continue for another year at least! The public image of baking has gone from strength to strength this year with the rise of the Great British Bake Off and most recently the spin-off programme with Paul Hollywood. The BBC has kindly asked the Silver Fox of Great British Bake-Off to put his money where his mouth his and make some programmes to show viewers how to make bread. If you’ve not seen the first episode, you can catch it on BBC i-player. The first episode starts with a bloomer, followed swiftly by a ploughman’s loaf (lots of lovely brown flour and rye and oat topping), a malt loaf (versatile and could be made into a sort of bread and butter pudding), and a ‘trencher’ to use as a base for some lamb steaks and greenery. That’s all squeezed into half an hour alongside a nice look at a farmer and a miller who have a great working relationship near St Albans at Redbournbury. I found it all quite exhausting to watch as Paul got stuck in to mixing and kneading, and boy does he knead strong, sometimes one in each hand! To the extent that I stopped watching what he was doing and started taking in the aesthetics of his kitchen and the slightly bonkers range of mixing bowls he had to use. It looked like the set designer had been given the run of John Lewis and got one of every type of bowl that looked like it would hold water. So the bloomer was mixed in a wooden bowl that looked like a salad bowl, then there’s a pyrex bowl for it to rise in, the ploughman’s loaf is made at the bakery at Redbournbury and is mixed in whatever they had, then back to Paul’s own kitchen for a nice white glazed bowl for the malt loaf, and then a blue coated steel bowl for the trencher. However, that all sounds a bit mean, and you can find other reviews of the programme on the web. So what about the bread? Well you can get the recipes online from the BBC, which is really what I pay my license fee for. I think they’ve tried to make the ingredients nice and simple, which is good, and so far only using instant yeast. They don’t give conversions for fresh yeast, so if you try them you’ll have to remember that you need approximately double the weight of fresh yeast. One thing did strike me as not being quite as it should be and that was the amount of salt that is used. The basic bloomer has 10g of salt to 500g white flour, and that’s twice the amount recommended by the Real Bread Campaign for home bakers to use. I usually follow the advice of the campaign and use approximately one teaspoon per large loaf. 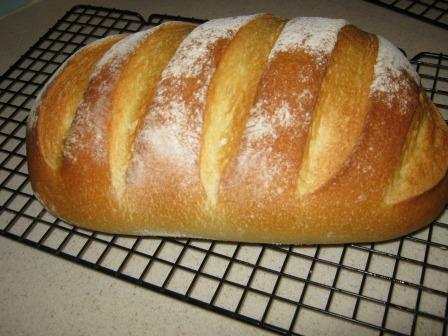 I’ve made Paul’s bloomer and it really is quite salty. If your palate is used to store-bought bread you’ll probably find it too salty as most large retailers have reduced the salt in the bread that goes into supermarkets. I’ve written another blog about salt in bread to give a bit more information. Click here. 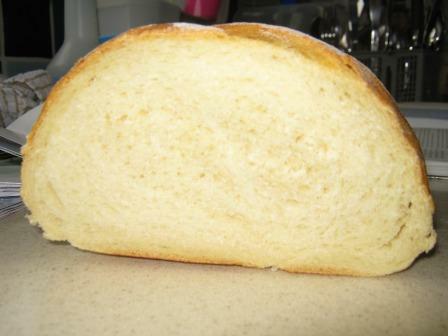 Also Paul’s recipe has approximately twice the amount of yeast you’ll usually find in recipes for baking white bread at home, so it rises quickly even though he says to use cold water. If your kitchen is quite warm and your water isn’t too cold it’ll probably go off like a rocket and you’ll get a good result. All of this mitigates against leaving the dough to rise slowly to enhance the flavour. The recipe uses olive oil, which is obviously not a traditional ingredient in British bloomers, and can be quite flavourful in it’s own right, so using extra salt doesn’t seem necessary to me. So last night, in between other things, I made a loaf strictly according the Paul Hollywood method, including muscular kneading, and another by the Dan Lepard method. 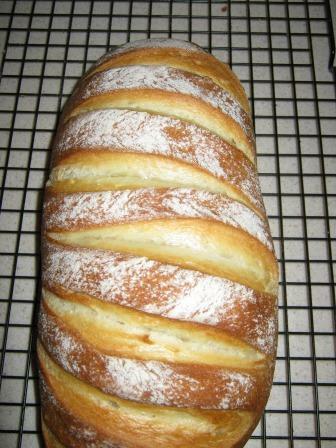 I really should have started the Dan Lepard loaf first, but didn’t think ahead enough to do that. Both turned out OK. The Paul Hollywood bloomer rose a lot and has a nice open soft crumb. The Dan loaf didn’t want to rise too fast, I think the kitchen was a bit cold, or maybe the packet yeast was a bit old, and in the end I had to bake it because it was getting late, it did spring quite well in the oven but didn’t get as large as the Paul Hollywood version. I’ve had lots of people searching for the bloomer and problems and ending up on my blog so there’s a ‘trouble shooting’ page here too. I’ll be trying the other recipes when I get the chance, in the meantime, if you want to give it go, do go ahead but go easy on the salt.